This was originally posted on 2/14/2013, but I felt that rather than being referenced, it should be re-posted. Its’ words still ring true. Here we are at the outset of Lent. Ash Wednesday has come and gone. The ashes on our foreheads have either been washed, or rubbed away. Regardless of which is true, the end result is that today has started like any other day of our lives. If we allow ourselves to stop and actually think about it, the only thing different is, we are in a very holy time of the year, a very holy time of our lives. 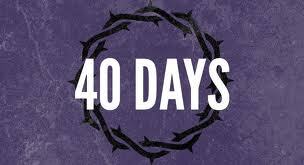 These next forty days are leading us to the very proof of Jesus’ immortality. We are in the desert, alone with God. Our actions over these solemn days will speak either of our love for Jesus, or for ourselves. This has to be a time of prayer for all of us. We know the world needs it, but we, too, need it. All of us have our faults, our problems, our worries and concerns. We are by no means perfect. And yet, with all of these imperfections, we must try to honor our God, praise our God, and love our God. It will not be a perfect love, because we are not perfect; but God is not asking us to BE perfect. He is asking us to TRY. Try to remember Him, try to seek Him out, and try to fall in love with Him, a little more deeply. All three readings in today’s mass contrast the works of the loving and those of the wicked. The first reading (Deuteronomy) speaks of the good and evil in the world. It begins with, “See, I have set before you this day life and good, death and evil…” The choice is ours. It goes on to say, “…if your heart turns away, and you will not hear, but are drawn away to worship other gods and serve them.” It is an either, or. We cannot have both. Apply these words to our world, today. If we turn away from God, and not listen to His words of love for us, we will be drawn away and worship other gods. The word “gods”, I’m afraid make us snicker or relegate the words as so much gibberish. Gods of today, will not be golden calves, nor fire, nor wind, nor thunder. They come as distractions, as cell phones, as pleasure, as money, as material things, as power, as comfort, as popularity. They come as anything which grabs our hearts, our attention and makes them the most important treasure for us at that moment. They turn us away from prayer, and substitute themselves for our God. These are powerful words. These cannot be any more open and revealing. The choice is laid out for us, we cannot deny it. We may not like being uncomfortable, we may not like having to be a little more demanding of ourselves but no one said Christianity was a cake walk. We can speak of the love of Jesus for us. We can speak of our love for Jesus. But when all is said and done, if we totally believe in something then we will want to totally strip away everything that prevents us from attaining it. That means the creature comforts that we don’t want to give up; that means the lofty attitude that we have of ourselves; that means the friends we need because they will help us advance; that means the power, the wealth, the pleasures, the popularity, to all of these we must lose our attachment. It sounds unbelievable, unattainable but it is what it is. It is Christianity. May our love for Jesus grow to such an extent, that we cherish the very sacrifices that we are called to make.